I have often wondered where my film career would take me. So many times, I feel that the project picks me rather than me picking the project. It’s sometimes a vulnerable feeling, as an editor, to think that one is not necessarily in control of their career path. But I have been very fortunate thus far. I have met some influential people who know how to tell a great story and at the same time, they push for change. This is why when Leslie Neale called me inquiring about collaborating on another project together, I immediately said yes. You see, I know Leslie is one of those people that I can rely on to shine the light on aspects of our society that need to be brought to the public eye. There are many things broken in our country and it’s our job as filmmakers to point out those deficiencies and demonstrate just how there can be a better way. A better path. A better future. And, hopefully people listen. I had no warning of just how much this project would change me by the time we finished the last edit. I took a deep breath. Content that I would soon be working on another documentary. I asked Leslie what Unlikely Friends was about. She replied that it is about victims of very serious crimes who faced their perpetrator and later forgave them for what they did. Not only forgave, but these powerful individuals actually become friends with their perpetrators. I paused and let the concept sink in for a moment. Leslie also explained that Restorative Justice is the process in which victims are allowed to face the one who has done them wrong. A concept that was being ignored in the justice system and therefore denying the right of many victims to heal in a way that made sense to them. 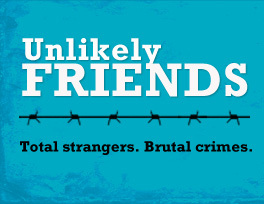 Unlikely Friends is much more than a film about a broken judicial system. As we explored the characters of this film, we found layer upon layer of different fascinating concepts that needed to be addressed. The psychological breakdown of a victim can be a terrible thing and it is often times too complex to comprehend. Taking on the task of getting into the minds of these people seemed like an arduous proposition. When we drove out to Phoenix to meet with one of the victims we would follow, I was extremely nervous. Towards the beginning of the shoot, I found myself in a car trying to keep the camera steady, worrying about sound, worrying about listening to a woman explain her inner thoughts and feelings about her extraordinary act of forgiveness to the man who killed her son. I was speechless. We were actually driving to go meet him and I couldn’t help but wonder if this could really be true. As we spent the next few days with her, I feel like I became very close with Debbie. She had completely changed my perspective and convinced me that not only was it possible to forgive, but that it was the right thing to do. We went on to meet the other victims in the film and with each interaction, I became more and more of a believer. In fact, I felt ashamed of the grudges that I had in my own life and sought to reconcile them. These victims taught me to see life differently, to never hold hatred inside and to realize that even when faced with disaster and extreme negativity one can still manifest a positive reaction and influence those that surround us. And if we are committed to it, we will become much happier in our lives. And that’s why I love my job, I learn so much from the projects that I work on and the people I work with. I thank Leslie for taking me along this powerful journey and to all the victims whose acts of kindness can teach us all a thing or two about life and love.